ADCO Diamond | Where is the love connection? How the consumer is losing out by buying online. I often tell my customers that they are not just buying a paper in the form of a certificate, nor will a diamond look in a ring the same as it does displayed in a computerized image. Marketers are cleverly luring customers to web sites with fancy technology by claiming their “signature” cut diamond merits a higher price tag. Then there are those companies claiming to be able to quantify brilliancy by displaying a diamond’s behavior under light in a “brilliant scope”. They will even resort to offering up a view of a diamond in a video artificially lit up by exaggerated LED lights. These digital magicians try to make you forget that we all need our senses to judge a stone, which means examining it in person: to touch, feel and look carefully at it. The most critical part of buying a diamond – beyond the color and clarity grade (to be discussed later) – is the subjective and very personal perception of brightness and brilliancy the diamond possesses. Ideally, one should examine many stones side by side before a neutral background and let natural daylight dance through the stones. 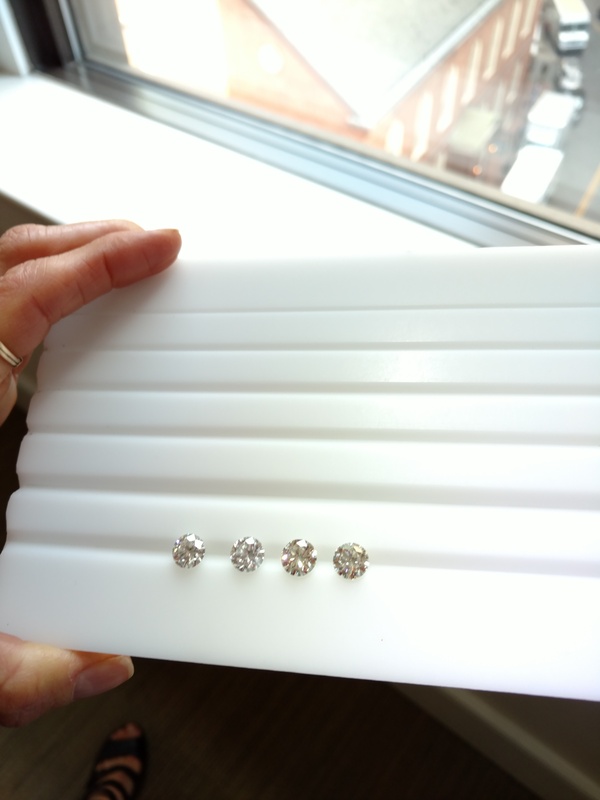 I have conducted an experiment with customers for 20 years, and have seen how nearly every customer chooses one particular diamond that to him or her stands out in brilliancy. Buying an image embellished by artificial enhancements takes the legitimacy and romance out of the diamond-shopping experience. How can one forgo touching, seeing, comparing, and gauging for himself the most brilliant one out of a lot, the one that “dances” the most? Wouldn’t your significant other be head-over-heels knowing that you personally handpicked a stone? That you experienced “chemistry” with that one stone, like you did with your partner? Where is the romance in shopping online? And what about the actual ring? Should you not touch and feel it either? Have you never been disappointed after purchasing items online that were heavily photo-shopped and misrepresented? 1) It’s important to understand that gradings of color and clarity are a range. Depending on where the grading falls on the range affects its rarity and thus price. It’s difficult to accurately judge clarity based solely on its plot (i.e., map of the stone). For example, a plot may show only one small spot on the certificate, only to be appear to the naked eye as a deal-breaking black mark. Color is just as difficult to judge, especially with fancy cuts. Diamonds showcase color differently with non-round shapes. A stone can appear lower in color from the face up than its actual grading belies. So it’s critical to see the stone in person and compare it to others. 2) True brilliancy cannot be displayed through a screen, in a photograph, or on video. Light source and light position affect brilliancy, along with background color. Furthermore, even if we keep these factors equal, judging brilliancy is personal act. We all perceive brightness and sparkle differently. I’m always happy to offer my opinion about diamonds to customers, but never before the customer has had some time to look at stones and choose the one that “speaks” to him or her. Would you buy a pet on line without meeting it in person? Would you buy a house without walking through it yourself? Does a diamond – as a natural stone with many facets to its personality – deserve less attention or respect, especially since it will be on the finger forever as a symbol of your love? Sure, people purchase items online all the time. But we are not talking about buying books or groceries. Diamonds are mined from different regions of the world; cut by different cutting masters using different tools; and graded by different gemologists. No two diamonds will be the same. 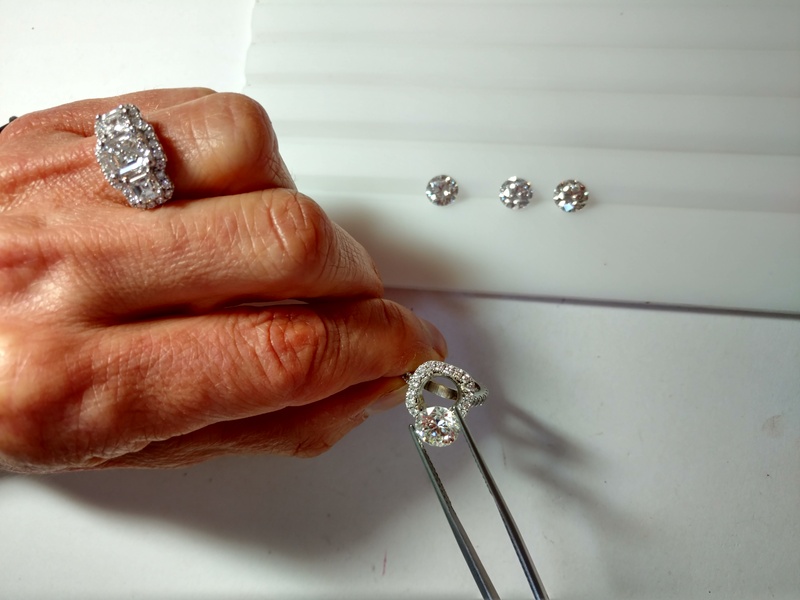 Spend some time online to learn from tutorials (or just come in for an extensive lesson with us), but the most important part of the diamond-buying process is the hands-on work of personally picking that one diamond. I will be sitting across from you with a wide selection of stones, ready to answer questions, and guide you. But the final choice is up to you. You will present your partner with a unique diamond ring that symbolizes your eternal love and devotion. Now that’s romantic!